The 2012-2013 NBA season has arrived and is ready for meaningful games again for the first time in four months. Our lasting image of last season was back in June when the Miami Heat won the NBA Championship over the Oklahoma City Thunder in five games. LeBron James finally won his first NBA championship as Dwyane Wade won his second title. LeBron also won his first NBA Finals MVP. LeBron finally got the monkey off his back. Two months later, LeBron would win a gold medal at the 2012 Olympics with his USA national basketball teammates in London. It must have been the greatest year of LeBron’s life. Now LeBron and the rest of the NBA have to put last season behind them and gear up for this new season that starts tonight. The NBA season tips off tonight with three games and they are the Cleveland Cavaliers vs Washington Wizards, Los Angeles Lakers vs Dallas Mavericks, and the Miami Heat vs Boston Celtics in a rematch of their seven game series in last seasons Eastern Conference Finals. This promises to be another great season as they will play all 82 games this season, unlike the 66 games they played last season due to the NBA lockout forcing last season to start on Christmas. So what’re my predictions for this season? Well lets find out now. Enjoy. #1 Miami Heat defeat #8 Philadelphia 76ers 4-0. #2 Boston Celtics defeat #7 Atlanta Hawks 4-2. #3 Indiana Pacers defeat #6 Brooklyn Nets 4-3. #4 New York Knicks defeat #5 Chicago Bulls 4-3. #1 Miami Heat defeat #4 New York Knicks 4-3. #2 Boston Celtics defeat #3 Indiana Pacers 4-3. #1 Miami Heat defeat #2 Boston Celtics 4-3. #1 Oklahoma City Thunder defeat #8 Minnesota Timberwolves 4-1. #2 Los Angeles Lakers defeat #7 Memphis Grizzlies 4-1. #6 Denver Nuggets defeat #3 San Antonio Spurs 4-3. #4 Los Angeles Clippers defeat #5 Dallas Mavericks 4-3. #1 Oklahoma City Thunder defeat #4 Los Angeles Clippers 4-2. #2 Los Angeles Lakers defeat #6 Denver Nuggets 4-3. #1 Oklahoma City Thunder defeat #2 Los Angeles Lakers 4-3. 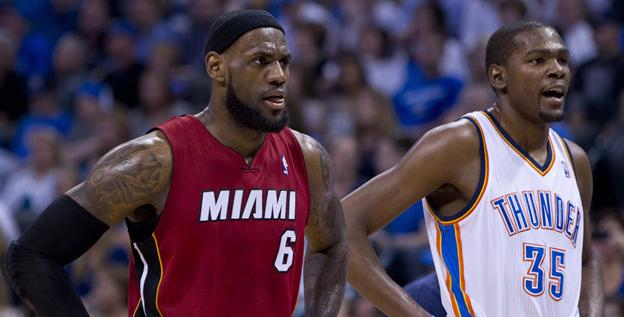 #1 Miami Heat defeat #1 Oklahoma City Thunder 4-2. NBA Finals MVP: LeBron James, Miami Heat. NBA MVP: LeBron James, Miami Heat, SF/PF. Others That Will Be In The Hunt: Kevin Durant OKC, Russell Westbrook OKC, Rajon Rondo BOS, Carmelo Anthony NYK, Deron Williams BKN, Kobe Bryant LAL, Chris Paul LAC. NBA Scoring Champion: Kevin Durant, Oklahoma City Thunder, SF. Others That Will Be In The Hunt: LeBron James MIA, Carmelo Anthony NYK, Russell Westbrook OKC, Kobe Bryant LAL. Defensive Player Of The Year: Serge Ibaka, Oklahoma City Thunder, PF. Others That Will Be In The Hunt: Tyson Chandler NYK, LeBron James MIA, Rajon Rondo BOS, Tony Allen MEM. All NBA First Team: PG Rajon Rondo BOS, SG Kobe Bryant LAL, SF LeBron James MIA, PF Kevin Love MIN, C Tyson Chandler NYK. All NBA Second Team: PG Russell Westbrook OKC, SG Dwyane Wade MIA, SF Kevin Durant OKC, PF Chris Bosh MIA, C Dwight Howard LAL. This entry was posted on October 31, 2012 by stevep. It was filed under Uncategorized .